Just three runners after scratchings at Ballarat on Sunday with Potemkin, Lady Loft and Diva Peron representing the stable. Potemkin (pictured) runs in race six, the Benchmark 64 Handicap over 1600m with Stephen Brown to ride, his claim reducing the weight to equal top weight. It will be the fourth run this campaign for Potemkin who was beaten under three lengths over 1400m at Sandown at his last run on June 6 and pleased Mike Moroney since. 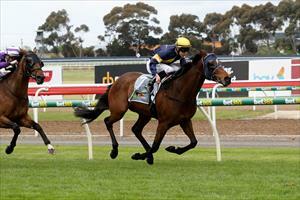 “He comes off a very good run last start at Sandown and has improved since then,” Moroney said. “He has drawn wide in barrier 10 but he has the speed to go forward and strikes a heavy track which he doesn't mind. Lady Loft gets a chance to go one better than her last two runner-up finishes in race four, the Open Maiden over 1400m where Brian Higgins will ride. “She has drawn wide, however that is offset by the fact she is better on rain affected tracks as she has shown at her last starts. “From the outside gate the instructions will be to go forward if she jumps well which she has been doing lately and Brian Higgins knows her well. Diva Peron makes her debut in race four, the 3YO Maiden over 1600m with Brian Higgins to ride. Her sire Mastercraftsman has enjoyed a Group I week at Royal Ascot and Moroney feels Diva Peron is ready for the races. “We are very happy with her going into this race and the 1600m is an ideal starting distance,” Moroney said. “She has drawn ideally to get a lovely run I’d be looking for her to be finishing strongly.